The saintly ascetic goes further and explains that the Incarnation requires preparation, for "the Lord did not say that He went out to plough the human fields, or to break up the ground two or three times, dig up the roots of the weeds and smooth out the clods of earth, that is to say, to prepare our hearts for cultivation, but that He went out immediately to sow. Why? Because this preliminary work on our souls prior to sowing ought to be done by us. That is why the Forerunner of the gospel of grace, anticipating this fact, says with a loud voice, 'Prepare ye the way of the Lord, make his paths straight' and 'Repent ye: for the kingdom of heaven is at hand' (Matt. 3:2). Our preparation and the starting point of repentance is blaming ourselves, confession, and abstention from evil'" (Homily 47). In the feast of the Incarnation of the Son of God we see the pattern of our whole spiritual life--God acts and we must respond. This synergy between divinity and humanity is an indispensable expression of the providential mercy of God. This is why we fast and intensify our ascetical efforts prior to every major feast of the Church. It is our responsibility to make sure the seed sowed by the Sower lands on good soil. 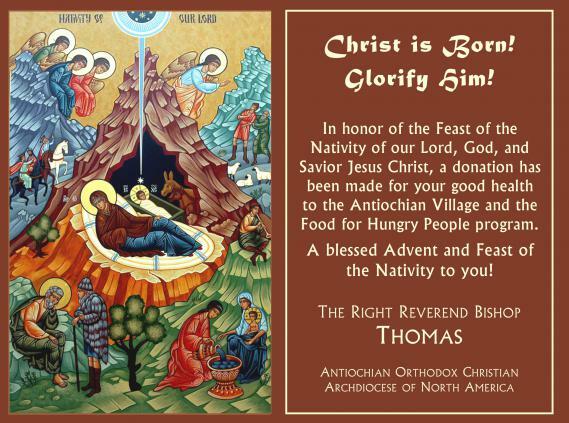 May the Lord Christ bless you and your families during this joyous feast of the Incarnation!